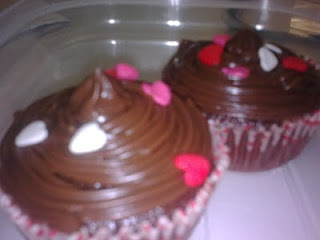 Choco Mumbo Jumbo: What's V.D* without cup cakes?! One way ticket to cupcake heaven! A work colleague and soul mate, with a passion for cooking and baking that surpasses mine, created these divine V.D* creatures. She used a basic vegan recipe and made it into a gourmet master piece(s)! The sweetness mixed with a hint of coffee left me shivering and tingling from it's decadence. It is so good, I think it is sinful!